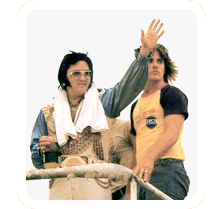 Elvis' stepbrother David Stanley recently took time out of his busy schedule to talk to EIN. David discusses progress on his first feature film, The Headhunter (an Impello Films/Aaron Productions motion picture), and a number of topical issues in the Elvis world. EIN: David, what is the latest with your feature film, The Headhunter? DS: Nigel, it is a very exciting time. The film is now "in the can" as they say in the movie business. After three months prep time since last November we commenced shooting in February and wrapped filming 22 days later. It was a punishing schedule of working 16 hour days but we are all very pleased with what we achieved. After being nearly a year behind schedule and raising millions of dollars to finance The Headhunter we can finally see light at the end of the tunnel. And we are very, very pleased with what we've achieved so far. EIN: Where did filming of The Headhunter take place? DS: Principal filming was in Los Angeles where we shot in and around Burbank, North Hollywood and down town L.A. The airplane scenes were shot in Van Nuys and we also filmed in Pasadena and several other places. We traveled quite a lot during filming so as you can imagine it was quite tiring. EIN: Who are the principal actors in The Headhunter? DS: We had a number of changes prior to shooting. Billy Baldwin, who was to play The King had an illness in his family and was unavailable. In his place we cast Peter Dobson. Peter is a well credentialed actor whose credits include Forrest Gump. Tom Sizemore, an actor who will be familiar to many people plays the role of Ronnie. Tom also has an impressive resume including roles in Saving Private Ryan, Heat, Pearl Harbor and Blackhawk Down. The character of Ronnie is a composite of two or three of the guys who was a part of the Kings entourage. Mark Roston, who appeared in Rush Hour and the Shawshank Redemption, has the role of Frank. Bryan Kurst plays Jeff. Bryan has appeared in the popular TV show, Charmed. Playing my girlfriend/1 st wife, named Katie in The Headhunter, is Danielle Keaton. Max Perlick plays the respected character of Darryl. We also have martial arts master Larry Tatum playing the character based on Ed Parker. I think people coming to see The Headhunter will be impressed by the quality of the actors whom we have casted. We have deliberately used different names for the main characters. There are a number of reasons for this. It would have been too expensive to hire 15 actors to play each of the guys in the Memphis Mafia so we decided to use composite characters instead. The device also allows us to focus is on the David Stanley character, not the King or the entourage. EIN: What can we expect in The Headhunter? DS: I must emphasise...The Headhunter is not a film about Elvis' life...it is a film about the David Stanley story. The Headhunter is about my experience on tour with the King and it’s effect on me. One day I was a high school kid, the next I was an adult in a very exciting world. It was my "end of innocence". The King has a primary role in the story but he is not the central character. Throughout the movie we refer to him as "The King". It is important to realise that those of us who grew up or were around Elvis each have our own "story, how we saw him, related to him. While "The King" features prominently in The Headhunter we are not trying to tell the Elvis story again. This movie is not about high collers, sideburns and hound dogs. There is no Elvis music and there are also no scenes of Elvis on stage. You will see him about to go on stage. We didn't want to include someone impersonating The King on stage. That never works because there was only one Elvis and nobody can recreate what he did on stage. From my perspective it is also important that The Headhunter be balanced in the story we tell. For this reason you will see several sides to the story. For instance, in relation to Red and Sonny's book, 'Elvis What Happened? ', the film will give their side of the story through Frank and Jeff. As with life, things are often not as black and white as we sometimes believe. EIN: David, how did you find it reliving some of the more emotional times of your life? DS: There is one particularly haunting scene which I think people will find very moving. It is the scene on the day Elvis died. It is very powerful and when I walked away from shooting it I had a tear in my eye. EIN: You're now into the post-production phase of The Headhunter? DS: Yes, we now are now heading in to 6 weeks of post production in Dallas and L.A . During this phase we will be doing all the editing, the sound mix and music score. Again, because The Headhunter is the David Stanley story it will feature a lot of my favorite music as I was growing up. ZZ Top, the Allman Brothers Band, Lynard Skynard. EIN: And promotion of The Headhunter? DS: There are several film festivals we schedule to attend. They include The Toronto Film Festival, American film Market – L.A., Sundance Film Festival and Caan Film Festival. We will be previewing The Headhunter at these and solidify national and international distribution. We know we will receive positive reviews . EIN: David, what category of film is The Headhunter? DS: Essentially The Headhunter is a drama. It has elements of tragedy and of course historical content. EIN: Have you secured a distributor for the film? DS: We have been talking with several of the major film distributors, Miramax, Dream Works, Lion's Gate. And we have had pre-buy offers from 22 companies. We are carefully considering which company we go with. EIN: When are you aiming to release The Headhunter? DS: We will initially release The Headhunter in North American theaters. Ideally, we are looking at a fall release around October-November 2006 or early January 07. EIN: David, you are the Director of The Headhunter. How are you finding the experience? DS: It has been fantastic and rewarding. It has been also very testing and challenging, but a wonderful experience. At one stage, Tom Sizemore said to me, "David, you're a natural!". It was great to hear that, particularly from someone with so much experience in the industry. Making The Headhunter wasn't all foreign to me. I majored in Communication and Film and have been around many film sets over the years, so at least I knew what to expect and had a conception of how I wanted to direct the film and what I wanted to achieve with it. EIN: You mentioned the character of Darryl is based on Charlie Hodge. How were you affected by Charlie's recent passing? DS: I was deeply saddened to hear of Charlie's death. I have very fond memories of him. He was a fun, happy guy. As a mark of respect to Charlie, at the end of the film we will be including:"In memory of Charles Franklin Hodge". EIN: We imagine that making The Headhunter has left you little time for other ventures. Have you been able to do anything else? DS: You're certainly right. Making a film is a demanding and exhaustive process. I still find time though for my other activities such as my motivational speaking through Solutionary Dynamics. Also, I'm looking forward to commencing pre-production of my next film, Predator In The Pulpit, in the late fall. It will occupy most of my time next year as the world marks the 30th anniversary of Elvis' death. 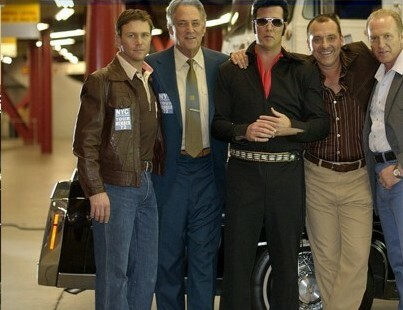 EIN: In a recent DVD documentary, The TCB Gang, Charles Stone tells the story that when Elvis died, he (Charles) actually had a plane ticket in his pocket to go to London to book Wembley. Were you aware of this? EIN: What is your view on Elvis tribute artists? DS: This is a difficult question. Many of the grass roots guys do their act out of real respect for Elvis. And there are some tribute artists who are consumate professionals. When the whole thing gets tacky, well, I think it's a bit like life...sometimes we have to take the good with the bad. EIN: David, did you see the CBS mini-series, Elvis, and if you did what did you think about it? DS: Yes I did watch it. I thought many of the scenes were quite well done, however I did not like the way the live performances were staged. They were not convincing. EIN: The sale of the operational arm of EPE to entrepreneur, Robert Sillerman. What is your view on this? DS: I think this is a smart move for both EPE and Sillerman. For the estate it allows them to ensure Elvis' legacy is professionally handled well into the future by a very successful entrepreneur. For Robert Sillerman, it offers him the opportunity to take the Elvis icon to another level. I'm looking forward to some of the breakthrough things he will implement. The idea of Elvis themeparks, an Elvis casino in Vegas, etc are brave concepts, but if they are successful the sky's the limit for Robert Sillerman and Elvis. EIN: David, thank you very much for talking to us. We look forward to the premier of The Headhunter. DS: It was my pleasure talking to you today and I know fans will enjoy the film. The HeadHunter is David Stanley’s life story, his true account of growing up as Elvis’ little brother, following his ascent into manhood and the struggles of life on the road as the King’s gun-toting bodyguard during the last tumultuous years of his life. David’s whirlwind lifestyle began when he was driven through the gates of Graceland at only four years old. His mother, Dee, had left David’s father, William “Bill” Stanley, a decorated war hero and former bodyguard to General George S. Patton, to marry Vernon Presley, the father of the biggest rock icon in music history. David, who had endured 21 excruciating foot surgeries before the age five, found himself welcomed into rock’s first family by the man who would become both brother and father-figure, Elvis Presley. He would soon learn that being Elvis’ little brother has its downside, as he had difficulties getting along in school. When the offer from the King came to become his bodyguard, David gladly accepted his place on the road at just 16. Physically imposing at 6’3” and 240 lbs., he was called “The Kid” by most of the entourage. By the age of 17, David was an expert in kenpo karate, carrying a nine-millimeter handgun, and most importantly, had the full trust of the King. The kid had grown up and was a force not to be ignored. Life on the road was both a blessing and a curse. David quickly fell into the lavish rock-n-roll lifestyle – comfortable private jets, power, money, and the company of beautiful women. It would be these same luxuries that would unleash his most personal demons. In an attempt to get his life together, David married Kate, his childhood sweetheart and a former high school cheerleader. However, David found marriage and the road mixed like fire and water, and again he was caught in a downward spiral, the result of the excesses of power, money, women and drugs. In addition to battling his own addictions, David was also witness to the problems that would lead to the King’s untimely end. As “The HeadHunter,” David would become one of Elvis’s most trusted allies, both brother and bodyguard, caretaker and confidant. Through the laughter and tears of the last five years of Elvis’ life, David would be there every step of the way, protecting the King from everything except his own worst enemy…himself.